Jewellery giant Tiffany’s is set to open its first independent boutique in Russia in Moscow’s high-end GUM department store. 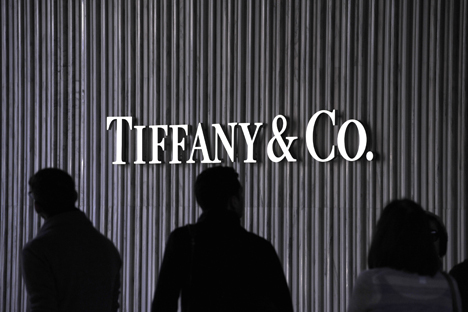 New York jewelry giant Tiffany’s has announced plans to open its own store in Moscow’s GUM shopping complex on Red Square in the first quarter of 2014. The store in GUM, one of Moscow’s most expensive department stores, will be the first retail project in Russia wholly owned by Tiffany’s. The store, of 420 square metres over two floors, will be “a milestone in our growth strategy” that “underscores the importance of the Russian market,” Frederic Cumenal, Tiffany’s executive vice president said in a statement. Tiffany’s usual Russian distributor is Mercury Group, the owner of TsUM, GUM’s rival department store in central Moscow. A representative for the company declined to comment on whether Tiffany would continue to work with Mercury, although its TsUM boutique is operating as usual. In Russia, brand jewelry is noticeably more expensive than in other countries, says Adamas representative Vlada Baranova, also suggesting that if Tiffany’s were to work in Russia independently – that is, without going through intermediaries – the cost of their jewelry could be cheaper. Operating in Russia directly cuts costs by 50 percent compared going through a distributor, says Emin Agalarov, commercial director of Crocus Group, which owns the Crocus City Mall on the outskirts of Moscow. The main thing is to sort out logistics and get up to speed on customs issues – but that’s not a problem these days, Agalarov says. According to researchers at Euromonitor, consumer spending on jewelry, silver, watches and travel accessories in 2012 increased by 17 percent to 530 billion rubles ($17 billion), with the jewelry market alone growing by 23 percent to 258 billion rubles ($8 billion). No other category in the luxury goods market – which, according to consulting firm Bain & Company, increased by 10 percent to 212 billion euros ($277 billion) in 2012 – showed such rapid growth. Tiffany’s revenue, meanwhile, is showing a much slower rate of growth: net profit in 2012 increased by 4 percent to $3.8 billion, while net income dropped 5 percent to $416 million from $439 million in 2011.